One of the smartest property buys you can make is a property that serves more than one purpose in your overall financial and lifestyle agenda. And there are few investments that do this more efficiently than the Uruguayan land parcel known as the chacra. Being a Uruguayan property owner is a natural segue into Uruguay’s financial system, with its multiple-currency and high-interest accounts. A chacra(CHA kra), which is a small farm or ranch, can vary in size from one acre to hundreds of acres, and is measured in hectares (one hectare equals 2.47 acres). Once they become larger than 100 hectares or so, the property is often called an estancia in this part of South America. Chacras are often part of a planned development project—called a fraccionamiento in Uruguay—and are seldom less than five hectares. This is because projects with parcels less than five hectares require all of the permits and approvals that apply to a housing development. Consequently, for developers it’s easier to keep their lots over the five-hectare threshold. Uruguayans will sometimes use the chacra for agriculture, but it’s more often enjoyed as a country vacation property… what we’d call a finca or quinta elsewhere in Latin America. With North Americans, my experience has been that they also often want a property for vacations or part-time living. However, they are additionally looking to store a hard asset in Uruguay, as well have a potential under-the-radar getaway should they ever want it. The people: Uruguayans are generally honest and punctual… they keep their word, conduct themselves professionally, and stand by their commitments. The culture is honest and hardworking, and levels of corruption are low. Yet they really are laid-back, in the truest meaning of the term. Uruguayans seem to have unlimited patience (even behind the wheel), they’re nonconfrontational, nonviolent, good natured, and friendly. In case you’re new to the region, these attributes are rare in Latin America, on this scale, outside of Uruguay and Chile. 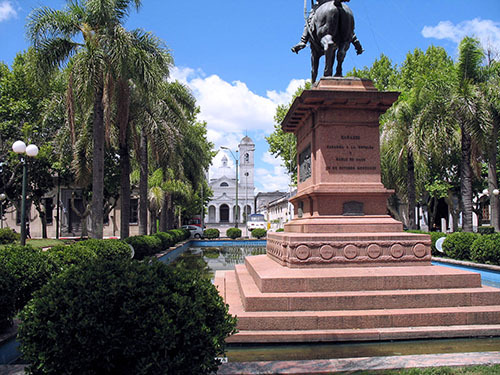 Solid financial system: Uruguay was known as a banking haven for a long time. Their famed bank-secrecy policy fell by the wayside a few years ago, but the financial services sector is still well-controlled and sound. The currency is stable, interest rates are attractive for the investor, and you can keep multiple currencies in your account. The infrastructure: In Uruguay you’ll enjoy fast, modern highways, reliable phone, cell, and broadband internet service, and drinkable water from every tap in the country. You’ll have free Wi-Fi in the buses and town squares, and even a public radio network. The government: Uruguay enjoys a stable democracy. No matter who is currently in charge—conservative or liberal—they respect the citizens, welcome foreigners, and encourage foreign investment. The government is as nonintrusive as they come. Agriculture: The country is a breadbasket, growing everything from beef to oranges to eucalyptus trees. And, because it sits squarely on top of the continent’s main aquifer, its abundant water supply is stable. The lifestyle: Uruguay has a moderate climate, with four seasons but no ice or snow. It boasts miles of some of the most beautiful and well-maintained beaches in South America… beaches that draw visitors from all over the world. The culture is European-like, and the cultural influence is primarily Italian. You’ll find tango clubs along with opera houses and orchestras. Uruguay also enjoys one of the lowest crime and poverty rates in Latin America, with one of the highest standards of living and highest per-capita incomes. Residency and second citizenship: Becoming a resident is not particularly fast, but it’s straightforward… with low financial thresholds for obtaining a visa. I obtained my visa myself, using the instructions given to me by the immigration agent in Montevideo. Citizenship is available after three to five years, depending on your personal situation. The biggest variable when buying is the utility infrastructure. A given chacra may or may not have public utilities on the property. If not, make sure you know how far away they are. Amenity levels vary greatly from one chacra to the next. Some come with a community pool, restaurant, clubhouse, beautiful stone gate, and other various niceties. Others are just a square of land with a gravel lane going by. Neither of these is the wrong idea… it just depends on what you want and how you intend to use the chacra. The next big variable comes into play if you’re using the chacra for agriculture. You’ll need to verify that the soil makeup coincides with what you intend to grow or raise. 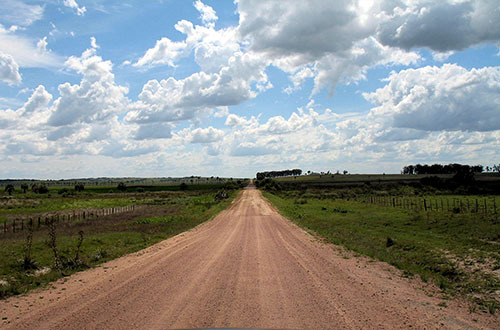 Luckily, Uruguay makes this easy with the CONEAT system… a system that categorizes every land parcel in the country with respect to soil quality, and provides an online lookup function. Finally, proximity to the coast is a factor… one that will jump out at you when you begin to look for properties. The closer you get to the beaches, the more expensive the property will be. One thing you will not have to watch out for is the security of the property transaction. The purchase process in Uruguay is well-controlled and secure, and the property registry is sound. Each transaction (by law) is managed by an escribano, a public official who serves as a real estate attorney. You’ll pay them 3%, which is steep by Latin American standards… but you can rest assured that the transaction is safe from any liens or claims and that everything is recorded properly. The market starts at about US$45,000 for a five-hectare parcel. For this price, you’ll get rolling hills, a stream, good soil, and a good view… with no improvements on the property. It’s in the department of Maldonado, about 40-minutes’ drive from Punta del Este. If you like, the owner will also sell some adjacent parcels. I saw a number of chacras in the range of US$45k to US$55k, with either minor improvements or no construction at all. This chacra is basic, with six hectares (15 acres) of rolling hills, running along the banks of the small but picturesque Paraje Las Cañas River. With native vegetation and palms, the property comes with a small house with one bedroom, one bath, living room, dining room, and kitchen. The property also features a small barn and a private well. It’s located 30 kms (18.6 miles) from the town of San Carlos, one of my favorite towns showcasing traditional rural Uruguay. The asking price is US$190,000. This one is also six hectares (15 acres), improved, and has the advantage of being 30 minutes from Punta del Este… so if you like the beach and would enjoy the amenities of South America’s number one beach resort now and then, this is worth your consideration. The property has two houses, both Bavarian style. One is a small, masonry, thatched-roof, two-story house, while the main house is a two-bedroom home made of wood with a rear deck that extends over the banks of the pond. The asking price for this one is US$350,000. This chacra has two houses, electricity, a private well, and nice views of the area. It’s being offered as a portera cerrada, which in Uruguay means that everything is included, from furniture to farm machinery. The asking price is US$120,000. 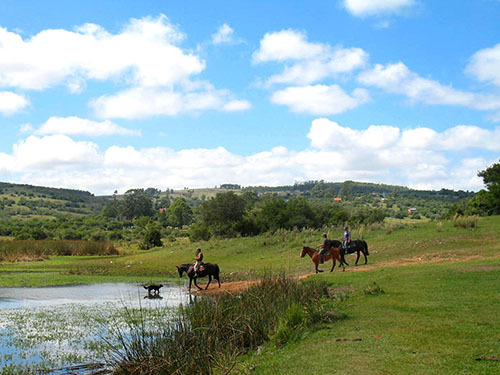 If you like the water and a larger property—56 hectares or 138 acres—there’s a chacra on offer near Villa Rosario, about 25 kms (15 miles) from the town of Minas, a small, attractive city in the interior. I like this one because it’s on a navigable portion of the El Soldado River. Of the 56 hectares, 30 are prepped for cultivation… the rest is wild. Electricity is 700 meters from the property, so figure that into your overall cost if you plan on building (and want to be on the grid). The asking price is US$308,000. A good agent for chacras in Uruguay is Noel de los Santos, owner of Campos del Este, an agency that specializes in these country properties. Noel tends to specialize in rural properties, rather than luxury properties near the coast. He can be reached at ventas@CamposDelEste.com. Noel is also the escribano who handled the purchase of my first property in Uruguay. See his website at CamposDelEste.com. When buying a chacra, the cost of entry is minimal, starting at around US$45,000 for a five-hectare parcel. For that price, you can have a vacation property now… one that’s capable of being a sustainable, off-the-grid property in the future if you want to use it that way. More importantly, you’ll have gained a foothold in Uruguay. With its liberal residency and second citizenship policies, it’s a country that gets top marks for freedom. I can tell you personally that it’s also one of the best places in the world to live. Why does Kathleen Peddicord say that Cali is going to be the next upcoming place to call home in Colombia? Kathleen was referring to Cali’s potential. Today, the property prices in Cali are very low, the cost of living is low, and it’s just coming into its own as an expat destination. Expats are buying properties, and a rental market is starting to bloom. But, with respect to shabbiness, you bring up a good point, Brock. In Medellín, there are neighborhoods like El Poblado that are exclusively sound and winsome… while others are almost exclusively run-down. But, in Cali, virtually every neighborhood I saw had at least some combination of sound and winsome homes and run-down homes. Personally, I saw this as a plus. I could go to a nice place like Cali’s El Peñón and find a bargain fixer-upper among the solid surroundings and amenities. I have recently purchased a property outside Santa Rosa de Cabal, Risaralda, Colombia. I would like your advice on the postal service in Colombia, as I will soon be living there full-time, and will periodically need to receive mail. Is there a secure method you would recommend, or is the regular postal service fine… I know that in some countries it is not. Personally, I always use the local postal service when I can for routine mail. In Medellín, I’ve never had a problem (that I know of). For important documents, I use FedEx, DHL, or UPS when mailing things to and from the United States. In my experience, mail reliability depends more on the municipality than the country. One city will be great, while the next one may be spotty. I’d suggest you try out the local post office with a handful of test mailings to see how they do. In any case, don’t send valuables or anything that might appear to contain something valuable. If you’re living “outside” Santa Rosa, I’d suggest getting a P.O. box in town. That will make it slightly more reliable and secure. Expect things to take three weeks to arrive from the States. As for other express delivery services (like FedEx), I don’t know which ones are available in Santa Rosa. Once you get there, look for a local branch for those important or rush items. Do you know if owner financing, contracts for deed, etc., are possible in any of the countries you are an expert on? Yes, depending on where you are buying, there could be a number of options available. See my previous essay on financing your property abroad.